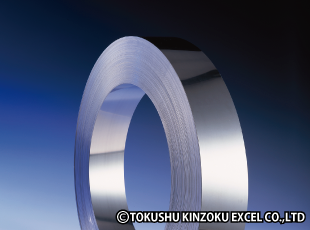 Austenitic Stainless Steel strip for springs (301, 304, 304L) | TOKUSHU KINZOKU EXCEL CO.,LTD. Stainless spring steels are classified as austenitic stainless steel. Due to their good balance of mechanical properties, they are the most widely used type of steel. They can be used in a variety of environments without being plated to prevent rust. In addition, as it is also possible to increase their hardness by rolling, they can be used as spring parts. In annealed and lightly rolled materials, they exhibit a large degree of elongation, and can withstand complex processing. SUS301 has a lower chromium and nickel content than SU304, which allows it to harden more when worked. Its high hardness makes it ideal for applications that require durability such as coil springs and dome switches. SUS304 provides good corrosion resistance, and is the most widely used stainless spring steel strip. SUS304L contains less carbon than SUS304. Its low carbon content gives it good resistance to intergranular corrosion, while its high nickel content gives it excellent corrosion resistance. SUS304L is easy to process because it does not become excessively hard. • Provides excellent corrosion resistance, eliminating need for surface treatments such as plating or painting and enabling use in quite poor environments. • Can be used in temperatures of up to around 300°C due to high recrystallization temperature. • Allows products to be made lighter thanks to a lighter relative density and higher modulus of elasticity compared to copper-base spring alloys. • Has strong directional properties as it is a cold-rolled product. • Has high electrical resistance. • Can be somewhat difficult to weld or braze. • Has higher tensile strength compared with other grades of the same elasticity, making it difficult to process. What is the difference between SUS301 and SUS304? SUS301 and SUS304 are both austenitic stainless steels, so there is very little difference in their outward appearance. The difference between them lies in their chemical composition, particularly their carbon, chromium, and nickel content. SUS301 is 0.15C17Cr7Ni, while SUS304 is 0.08C18Cr8Ni. This difference actually affects the mechanical properties of the steel after rolling, for example, SUS301 can be made stronger than SUS304 by rolling. SUS301 is recommended for applications that require elasticity, due to its ability to acquire a high degree of strength when rolled. Our ability to produce uniform strength and thickness tolerances that are impossible to achieve using regular materials allows us to manufacture products that demonstrate stable strength in spring applications. Moreover, we can produce excellent fatigue resistance and reliability by adjusting material structure and by creating a high degree of cleanliness via the careful management of manufacturing history and the adjustment of chemical composition. We can manufacture materials such as SUS301-EH and SUS301-SEH, which provide strength and elasticity that compare with quenched steel. The materials we use are not prone to cracking during processing despite their high hardness, and enjoy a good reputation amongst our customers. By restricting the number of substrate suppliers we deal with, we are able to offer a stable supply of materials with good elasticity and little variance between lots. We can manufacture ultra thin sheets of 0.010 to 0.099 mm. and are also happy to consider smaller lots upon consultation. We make products to order, and can adjust hardness as required. By changing the roll used in the rolling process, we can offer a bright or dull finish. If required we can also provide a hairline finish (outsourced). The deflection factor (Young's modulus) of stainless spring steel is highest for softer materials (although it can be lowered by rolling). Under normal usage conditions, the deflection factor for SUS301 and SUS304 is 167,000 N/mm2, and this is the value that we use as standard when calculating the spring deflection limit. When replacing springs made from copper alloy (phosphor bronze: 98,000 N/mm2, beryllium copper: 118,000 N/mm2, nickel silver: 127,000 N/mm2) or quenched steel (206,000 N/mm2), it is necessary to add thickness or width. Since stainless spring steel is manufactured by cold rolling it is inevitably anisotropic. Spring steels with greater elasticity have a higher reduction rate and therefore stronger anisotropic properties. As a result, it is necessary to consider how anisotropy may affect usage. Normally, spring steel is strongest (in terms of tensile strength, spring deflection limit, yield point, Young’s modulus, etc.,) in the direction perpendicular to the rolling direction and weakest in the direction parallel to the rolling direction. When it comes to elongation, the situation is reversed. Consequently, when selecting a material that will be bent, ensure that any bending axes can be oriented somewhere between the direction perpendicular to the rolling direction and about 45°. Processing conditions must also be carefully considered because as the strength of a material increases, its toughness decreases, resulting in increased spring back. Stainless spring steel can be used as rolled, but if strong elasticity is desired, it is recommend that parts are annealed at a low temperature of around 400°C after processing. Low-temperature annealing must be performed after the material has been processed. If a material that has already been annealed at low temperature is processed, the effects of low-temperature annealing will be lost. The material should ideally be heated at 400°C–420ºC for 1–2 hours to allow the metal to acquire optimal properties. Depending on material properties, equipment used, and operating conditions, the material may be processed for a suitable time at 200°C–450°C. For low-temperature annealing in air, a gold-colored oxide film will occur on the surface. This oxide film can be removed simply using weak hydrochloric acid or mechanical polishing. Low-temperature annealing at 400°C–420°C can produce excellent mechanical properties in the metal, but corrosion resistance will be somewhat reduced. If corrosion resistance is required, it is recommended that the metal is annealed at 350°C or below. If foreign matter such as dirty oil and detritus is not removed before low-temperature annealing, it may be burned on to the surface of the material, which can affect corrosion resistance. It is therefore important to wash the material thoroughly before the heat treatment. Precipitation hardening (heat treated) stainless steels are grades that can provide high strength. They are ideal for applications requiring workability and high strength. We supply SUS631 (17–7PH) and SUS632J1 (15–7PH) grades. SUS304 is non-magnetic when solidified (annealed), but has magnetic properties when cold rolled. 305M is an improved grade of SUS305 for applications that require non-magnetic materials. Its non-magnetic properties are more stable than those of SUS305.